Small wardrobes are often some of the hardest items to find for the home. As families grow and the need for storage space increases, the hunt for small wardrobes and space saving storage solutions becomes ever more important. Search the internet for small wardrobes and you’ll find a range of solutions sold by large retailers up and down the country. Like most people you’ll soon realise that wardrobes come in a limited number of sizes, many too small to be useful, or too big to fit the space you need them for. At Arley Cabinets of Wigan we’ve been helping many home owners deal with this problem in the most effective way for over 65 years. We provide the perfect solution by building bespoke small wardrobes. Small wardrobes designed for you and your home. All our small wardrobe solutions are designed and built to suit you and your home. We take the exact measurements of the space then spend time to understand how you need to use the space. Some people need more hanging space, others need a combination of draws, shelves and hanging space, the choice is yours. Armed with the facts about you and your home we provide you with a range of solutions to choose from. Next our craftsmen, based in our Wigan workshop translate the technical drawings into the working system of your dreams complete with fixtures and fittings to suit your needs. Finally our installation team ensure your small wardrobes are fitted perfectly in your home, so you don’t have to worry about a thing. It’s true you get what you pay for, however quality can cost less than you think. At Arley Cabinets a small wardrobe system built to your exact needs can be better value for money, last much longer and provide the perfect use of the space than any off the shelf small wardrobe. Plus we only use the very best materials, premium fittings and finishes in all our furniture. Arley Cabinets of Wigan manufacture all cabinets at our headquarters in Wigan meaning we can provide you with superb turn around and delivery times. If you need a small wardrobe in a hurry we can help, simply contact us today to find out more. 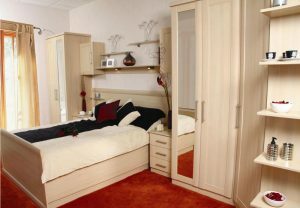 From one small wardrobe to a whole fitted bedroom suite Arley Cabinets of Wigan are here to help. Established since 1952 we have the experience and expertise to ensure you have perfect peace of mind. Contact us today for a friendly chat.